A highly filtered linear regulated Power Supply delivering +12V at 5A and +5V at 5A. Before I begin, what was I using before? 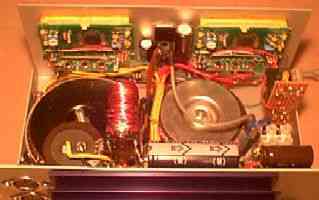 Here are two pictures of my previous station power supply. 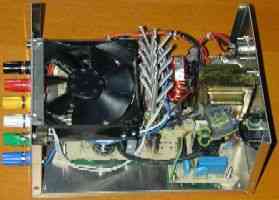 This consisted of an ex-COMPAQ PC 300W PSU repackaged in an aluminium box with connectors on the front panel. One problem I had with this power supply was that it ran quite hot, even when supplying no current. It had internal sensing to determine whether or not the fan was running, and switch itself off if not. So my original idea to do without the fan failed on two counts. I had to mount the fan inside the case, and never got round to drilling ventilation holes in the case. It was therefore necessary to operate the PSU with the lid removed. A worse problem was switching noise! Switched mode power supplies are said to be RF-noisy due to their switching action. 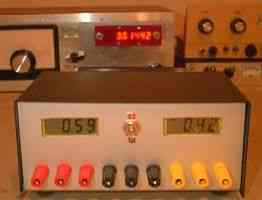 However with my Polyphase SSB receiver I had been unable to detect any difference in noise levels compared to an old linear PSU so I had dismissed the noise problem. When I built my simple 30m direct conversion receiver I found the switching noise was terrible! I managed only two QSO's through the S9 racket. I reverted to the old PSU and the problem dissappeared, but was replaced by objectional hum. This was resolved by adding further smoothing and filtering using a large 8,200uF capacitor and an inductor. I also discovered that the switch mode PSU was responsible for bands of S9+ noise on my Polyphase SSB receiver too, occupying a couple of KHz and spaced at approx 50KHz intervals; and often falling right near 3.560 making my operation difficult. I had previously dismissed these noise bands as external neighbourhood QRM! This power supply provides +12V at 5A and +5V at 5A. Each voltage is regulated by a separate LT1084 regulator, a high quality device with built-in short circuit and thermal protection. 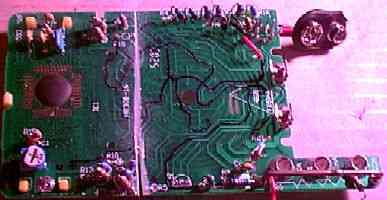 These are linear not switching types, therefore the efficiency is much lower but they do not generate so much RF noise. Because of the lower efficiency, heat dissipation is higher and a large heatsink required. 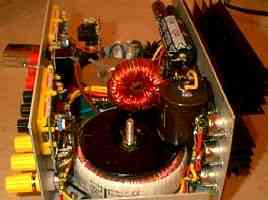 In this design I used toroidal transformers: they are lighter and smaller than conventional EI-style transformers, yet nowadays they are almost the same price. I used a separate toroid for each voltage: 12V and 6V respectively. Each toroid has two primary windings which are connected in series for 240V UK operation, and two secondary windings which are paralleled to get the full current capacity of the transformer. 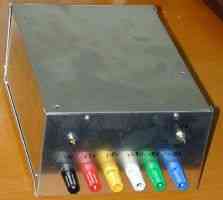 The design uses heavy filtering on the +12V line, since this is from where most of the RF equipment will be powered. However the +5V line does also include a choke filter. Both these inductors were scavenged from the old switch mode PSU. The larger inductor in the +12V line had several windings in the switch mode PSU: these were connected in series for maximum inductance. 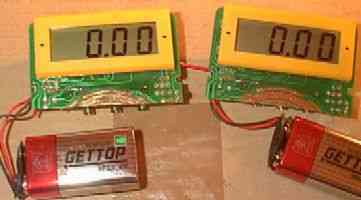 Each output is separately metered by a digital ammeter. More on these below! Below is the circuit diagram of this power supply. Note that the digital ammeters each require a 9V supply. The supply needs to be isolated from the current I am trying to measure. To do this I used an old technique of connecting capacitors in series with the 12V a.c. then rectifying and regulating, to provide effectively DC-isolated power. This technique works very well. There are two of these circuits, one for each ammeter. Here are three pictures of the inside of the PSU. Spot the three toroids? 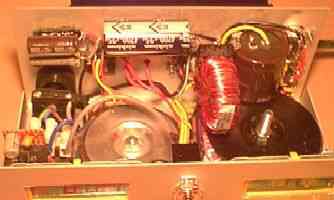 The largest, bolted to the floor and with a black disk on top, is the 12V 60VA transformer. Bolted to the floor with a steel disk on top, you can see the 6V 30VA transformer. Finally the smallest toroid, with shiny red enamel wire, is the inductor in the 12V filter. 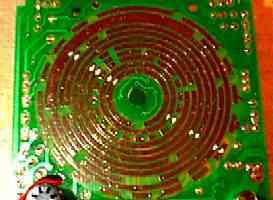 Scroll back up to the top and you might be able to identify this toroid in the old COMPAQ switched mode PSU before I dismantled it. In the following two pictures you can see the PSU operational, powering my Polyphase SSB receiver. The front panel switch between the two ammeters is the On/Off switch. The left side of the panel is 5V, with 12V on the right. 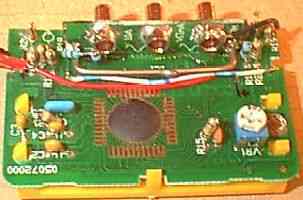 The +5V output is used for the frequency meter and clock in the front panel of the receiver. 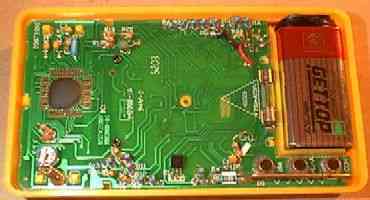 The +12V output is used for all the RF and audio sections in the radio. 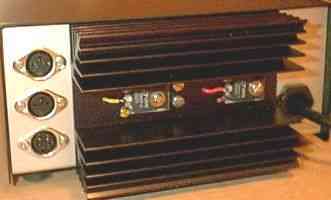 The rear view shows the large heatsink with the two LT1084 regulators bolted to it. It's thermal resistance specification is 1.2C/W. Now for more about the current metering. What do you do when you want to provide front panel metering? Moving coil meters? No, they are expensive, large and not very accurate. 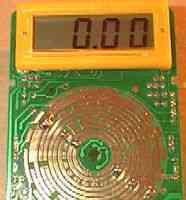 Digital panel meter modules? Very nice but they are even more expensive, so no. Instead, you go and visit Maplin Electronics and look for their digital multimeter (order code N20AX), priced at a mere 2.99 (UK Pounds), battery included! Incredible. I bought 2 and performed delicate surgery to convert them into compact panel meter modules. 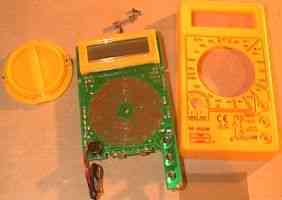 (Actually I got 3, one to replace my aging multimeter, the exact same model purchased some 3 years ago (at 4.99) and still going strong but suffering from some cosmetic damage due to numerous drops, scratches and splashes of molten solder hitting the display). 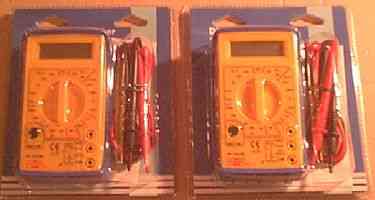 Here are the two nice new multimeters, innocently unaware of their impending fate. Inside, they are remarkably well made considering the low price. As I had hoped and expected, the chip is located at the top behind the display. The rest of the PCB is mostly concerned with the mode selector switch. Notice the three connector sockets at the bottom right of the internal picture. Underneath them is a thick copper wire. This is connects the two end sockets, the "10A" and "COM" inputs. These are the ones I use here (don't forget the PSU outputs are rated to 5A). 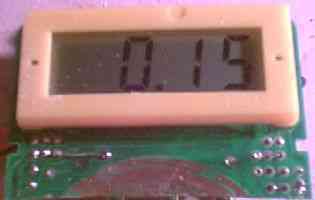 The metering works by measuring the tiny voltage across this very low resistance section of wire. From unit to unit, each wire has either a nick cut into it, or a small blob of solder added. These would have been done in the factory in order to modify the resistance of the wire very slightly and perform fine adjustment of the current reading. As I said, these meters are cheap but they are far from being junk. Removing the PCB reveals the complex mode switch (left). As soon as the plastic switch knob is removed, out pop 2 ball bearings used against dimples in the case to effect the clicking action of the switch. The rear of the switch has six sprung contacts, each with two prongs which connect pairs of tracks on the PCB. It isn't at all easy to see which prongs will touch which tracks, when the multimeter is switched in its 10A mode. To overcome this difficulty, I placed small blobs of glue on the prongs and temporarily put the PCB back into the case with the knob pointing at the 10A current setting. Hey presto, small white blobs on the PCB reveal exactly where the switch contacts should be (middle photo)! Replacing those six pairs of glue blobs with solder bridges across the tracks and applying the power (right) - yep, that's the 10A mode as it should be. Next, the DVM detective goes to work, in the hardest and most crucial part of this surgery. Left: I carefully traced tracks, removed unnecessary components, and began sawing off the unwanted switch section of the PCB. Then I remembered I'd better take a picture before I went any further. That's why you can see the PCB partially sawn. Did it work? Err... no. Luckily I still had the other meter intact awaiting it's own turn in the operating theatre. It was possible to re-examine it and discover which track I had missed. You can see in the right hand photo that in the end, only two wires were required to hardwire the meter into its 10A current reading mode (the red wire and white/blue-striped wire). I also sawed off the piece of PCB containing the sockets and the all-important piece of very low resistance wire, and glued it at rightangles to the remaining PCB. The manufacturers had to measure the tiny resistance of that bit of wire, and even apply a small blob of solder to decrease it slightly... who am I to interfere with that delicate process! Finally, the result was worth all that effort. Left photo: one meter displays the current as a rather unhappy 9V battery discharges itself aimlessly into a 50-ohm resistor (two 100-ohm in parallel, actually these were part of the original meters!). Yes, I know it displays only 0.15 amps and Ohms law says it should be 0.18. Well it did originally read a little higher but as I said, that poor (no doubt budget) 9V battery was not at all happy about the procedure, and becoming even less happy the longer I waited. Right: The two neat panel meter modules ready to be glued into the front panel of the PSU. How does it sound? Wonderful! On my Polyphase SSB receiver and my simple 30m direct conversion receiver there is absolutely no hint at all of any 50Hz hum whatsover, not even with the volume pumped up to the maximum and the antenna disconnected. The noise floor is very quiet and the band teaming with signals.